The Daily Prompt Mission for today: “Is there a painting or sculpture you’re drawn to? What does it say to you? Describe the experience. (Or, if art doesn’t speak to you, tell us why.) Photographers, artists, poets: show us ART”. For todays Daily Prompt, I rather go the photographers route and show you ART. The photo above is not a good shot. It´s rather a snapshot. In the image you can see what my aunt painted. I took the photo in one of her rooms. I do think her paintings have potential. 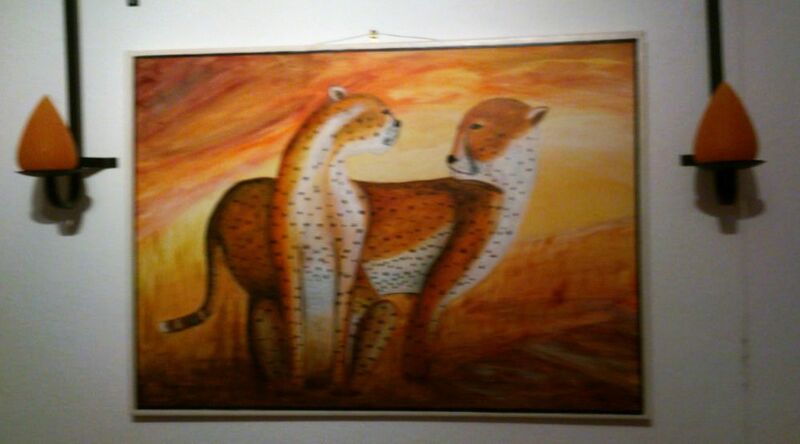 I love the colours and the body shape of the animals. But I am not so happy with the shape of the heads. I do think the head shape of the right Leopard is too big. But I like the painting apart from that. And I am happy that I have some creative people in my family. Always good to know that they have good interests. My family has some talented artists in it but I’m afraid the art gene, at least as far as painting/drawing/etc., passed my by. I do my art through writing and photography. What fun to be able to have a painting done my your aunt! I know what you mean. We have several painters in the family but I also did not get that talent. I am still creative but more into music, playing guitar. And I do some amateur photos and can work with programms like photoshop to edit the photos. So I know what you mean… we sadly can´t have every talent 🙂 I wish too that I could draw. But still funny to see the work from the family or friends. Creativity is just great. Always a great thing to have creative genes. More than anything, the creatives of your family appreciate individuality. I love it just as it is. Thanks for posting it.